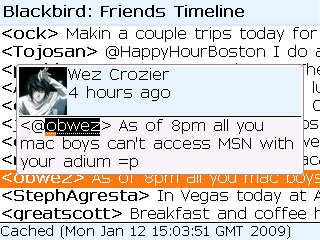 A Twitter client for BlackBerry smartphones. Blackbird logo generously contributed by David Rush. Continue to reorganize Java source. Make change to wheel click handler to allow 71xx users to access the context menu using ALT-click. Tweet detail view now shows the user's avatar. @usernames are now active links to the Twitter user's URL. Timeline data is now cached in persistent storage. Move build-time constants to its own class and file. Changing files per build that are under SVN was a mistake. Now, only templates are stored in SVN, actual files in use are ignored. Eliminate the constants .tmpl file, just regexp replace the file in-place now. Automatically update the Version string in the .jdp files as part of the pre-build step. 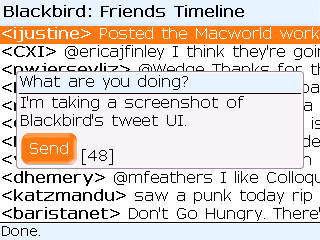 Display tweets as an ActiveRichTextField so that hyperlinks can be opened inside the BlackBerry Browser. New icons from David Rush. Fix off-by-one bug in entity escaping code. Generate alert dialog on HTTP status codes other than 200 OK. Escape non-XML entities to prevent SAX parser from throwing a SAXParseException. On failure to send a tweet, present user a dialog to resend. Changed Logout button on Options screen to not display the save prompt. 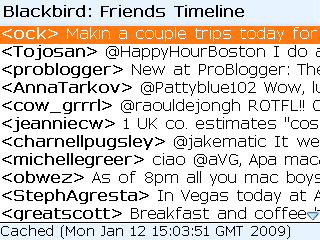 Parse tweet timestamp and display in message view popup window title. Display rate limit error and other XML parsing errors as a Status popup. Remove Twitter API URL prefix off the Login screen. Only changeable from Options screen, now. 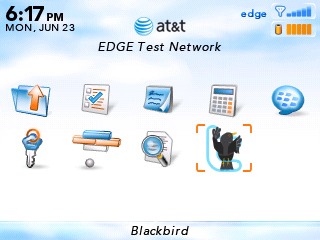 HTTP "deviceside" parameter now configurable in Options screen as either "TCP" (default) or "BIS/BES". Render Twitter timelines and individual tweets with bolded usernames. Fix keyboard shortcuts for reply and direct messages for SureType/MultiTap BlackBerries. Add relevant menu options to individual tweet display popup. Bumped release to 0.3, using David Rush's contributed icons. Add build.properties to svn:ignore list. Added BlackbirdConstants.BUILD_STAMP, from build.properties file.